QualSpray Disposable In-line Filter – this filter removes oil, water, rust, dirt and other particles that get through other downstream filters. It’s designed for low restriction of air so you can install it right at the gun and won’t affect low pressure guns like LVLP and HVLP. A very economical way to remove the last trace of contaminants before they enter the gun. QualSpray Transparent In-line Filter – removes air line water before it can get into your gun or pressure tank. Easily mounts right at the tool air inlet to provide the best protection. Water is purged by depressing a small plunger and the filter can be taken apart and cleaned if necessary. Item is bi-directional. QualSpray In-Line Desiccant – When you need to remove all traces of water vapor and oil, this economical in-line desiccant works just like the expensive wall mount units. Uses silica to remove every trace of oil and water and changes from blue to pink when it needs to be changed. Item comes with 1 extra silica change and has 1/4″ female and male connections. Item works best when a water extractor is installed before unit to remove liquid water in line. Unit is bi-directional. 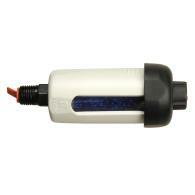 QualSpray Economy Regulator/water filter – traps water, and contaminants. Inline design allows mounting to a compressor output or wall (bracket included). 1/4″ inlet and outlet with manual drain. Large regulator gauge is easy to see. 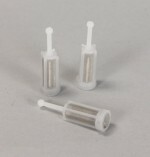 The best in filtration at a great price. 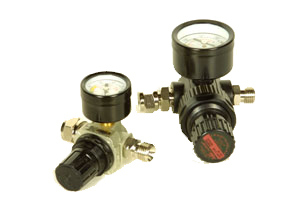 QualSpray Professional Regulator/filter – traps 99% water, and oil and contaminants down to 5 micron. Large body design allows mounting to a wall with built in bracket. 120 cfm flow capacity and 300 psi maximum pressure. 1/2 NPS inlet and 1/4 NPS outlet with shut off valve. 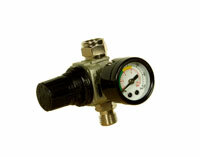 Large self-relieving regulator reads accurate pressure. Manual drain. The best in filtration at a great price. Best when used 25′ or more downstream of compressor. 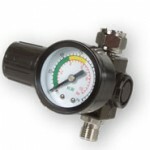 The regulator with gauge allows you to regulate air very precisely right at the gun, where it matters most. Can be used with gravity feed and pressure feed systems as well. 1/4″ threaded male (on input) and 1/4″ female (on output). Diaphragm type regulates air more consistently. 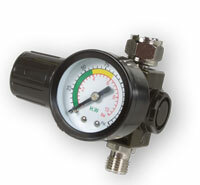 This regulator is about 1/2 the size of a standard gun regulator like the QS-03. 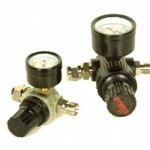 Ideal for the smaller footprint of detail guns or whenever you want to use a smaller regulator. 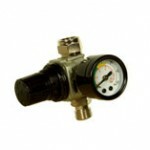 Can be used with gravity feed and pressure feed gun with a 1/4″ thread. .
0-150 psi. Diaphragm type regulates air more consistently. Glass lens.